Hi friends! I hope you're having a great day! I'm a sorry mess today. I think I have some sort of cold that's causing a runny nose, sneezing, and pink eye. You would think after all the antibiotics, I couldn't get pink eye but somehow I still managed. Yeesh. :) I'm actually in ok spirits though. Today, I'm sharing a card made for a couple challenges. I made this for the Hero Arts Sunshine and Showers Challenge and Retro Sketch #6. I pulled out my Copics and colored her skin, are you surprised? I even strayed away from my normal skin combo and used E50, E51, and E53. The papers are Basic Grey Konnichiwa and the stamps the matching ones from Hero Arts/Basic Grey. I added some gems, Stickles, and letter stickers. ETA: The adorable Arielle Gordon told me that I could also enter this in this week's ColorQ #132. LOVE this card! Such a great image and I love your paper choices! Oh girl...I am waiting for the day that you are able to say all is well. You certainly are having more than your fair share of health issues. Thinking of you...I know how hard it is to be sick/in pain on a daily basis while trying to raise two kiddos. Take care! Hope you are feeling better today! LOOOOOOOVE this card--def. one of my FAVS! FAB! A card to make someone smile. She's so cute! Ashley - this is so adorable! LOVE that image, she is so cute! Your coloring is awesome, too! Thank you so much for joining us at RetroSketches this week! Thanks for playing along with us this week at RetroSketches! Cute card, Ashley, love that background you made! 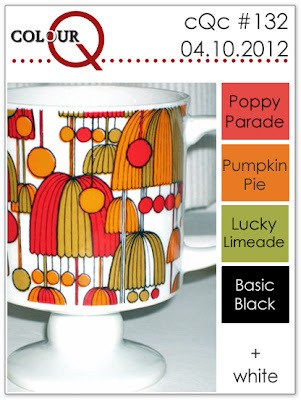 Thanks for joining us this week at the ColourQ and sharing your card! 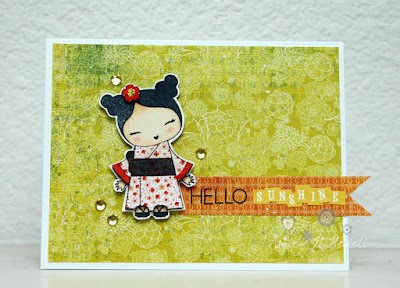 Your card is just adorable, love the bling you added!